The breeze blowing gently through your lace skirt, your hair curling around the flowers tucked away in your updo, pops of color, and a lot of texture, there’s something so effortless and organically beautiful about a rustic wedding. Today, we’re talking a bit about rustic style and how to make your table decorations both memorable and fit within your dreamy theme. From wildflowers to burlap – of course – we’ve got all kinds of decor ideas up our sleeves and on display today. Take notes and gather some inspiration for your own country-flavored affair. What is “Rustic” Wedding Style? Rustic wedding style coincides nicely with outdoor celebrations and country-inspired accents. Raw edges, texture, natural influences are at the heart of this genre which is why so many of these events take place outside or in barn or farmhouse-created venues. Earthy tones and relaxing vibes take up a great deal of this space. It’s all about embracing comfort and organic beauty here. What’s Included in Rustic Decor? Layered wood pieces and small bouts of fresh flowers make this scene extra charming. Perfect for springtime, everything on the table is highlighted by natural lighting and pops of green. Notice the addition of the lantern and wooden, textured vases bringing in even more romance and organic feels. 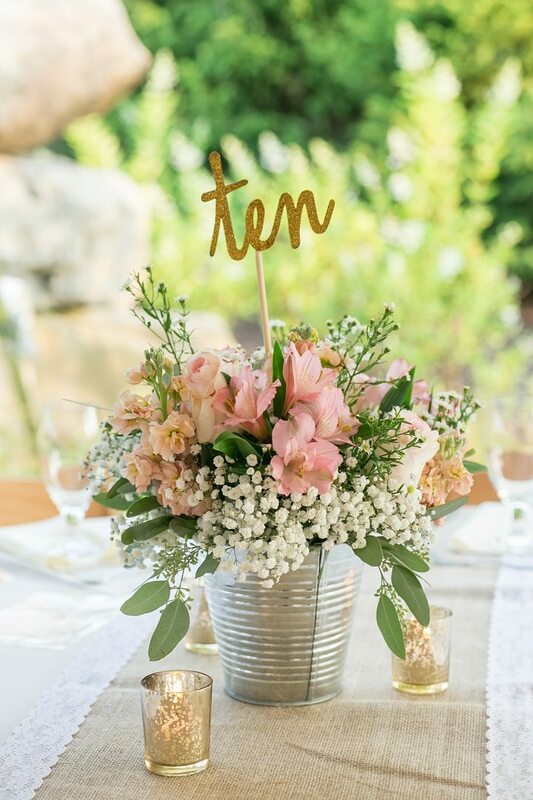 Metal tins, old cans, and buckets can easily be used as offbeat vases for your floral arrangement. They add a mixed material vibe that works well within rustic visions. Offset the look with burlap runners and a dollop of lace for extra texture and romance. This spread is perfect for weddings that have a rustic vibes but with an inside evening scheme. Reused wooden planters and raw wooden planks set the stage while distressed copper and gold candle holders give the design a more formal push. There’s something extra romantic and about this spread as well, which is always nice for weddings. Take a peek at this gorgeous, natural chandelier. Highlight the sweetheart table or add a few of these types of designs as a way to bring the eye up throughout the reception. If you’re using smaller tables or have a lot of open space, using wood, greenery, and mini lanterns will definitely do the trick. Even pine cones can look elegant. This simple spread can easily be DIYed yourself as well. Some glass vases, fresh florals, votives, and a bout of pinecones can set off your rustic celebration with both charm and interest. If you aren’t a huge fan of burlap, you can find other fabrics that will do a similar job. Just take a look at this woven, gray table runner. It’s perfectly rustic in the end design but also a bit lighter, more romantic, and feminine as well. Cotton can also be a really unique and fun way to decorate the tables as well. If you love a bit of country-flavored style, then think about adding a batch of this to the scene. Fill votives, vases, or use them as fillers in the floral arrangements. Here’s a more formal setting that’s offset by an organic centerpiece that pays homage to a rustic, homey style. DIY pallet planters can easily be made before the big day and save money doing so. Then, fill it up with succulents or wildflowers. Check out these unique wooden centerpieces! Guests will easily be able to hold conversations throughout the table without the decor in the middle getting in their views when they’ve been heightened like this. Branches and fresh florals are a quintessential “rustic” wedding style pairing. A more casual layering, this spread is set off by chocolate plaid and pops of fun petals. There’s even an outdoor chandelier that brings the table’s look full circle. Perfect for autumn weddings, this one has a homey vibe but one that’s still very appropriate for weddings. Here’s another beautiful scene where we seen pallet baskets – or planters – being utilized. Again, you can easily DIY these yourself and we’re swooning for this simple set up. Lush flowers inside and lined crisply on the banquet tables, this is a gorgeous mix of contemporary edges and rustic accents. Remember, rustic styling is really all about natural nuances and organic beauty. So, simplicity may be the best way to go. A wooden table, a white runner, and then lush bouts of baby’s breath creating a voluminous garland is such a romantic and bohemian touch. For an extra country nod, think about adding some wheat to the table’s design. If you’re celebrating outside and want a more casual feel, pay attention to this easy-to-recreate setup. There’s baby’s breath thrown in there too for some softness as well. And finally, lanterns make a beautiful centerpiece and an easy focus for the table. Fill it with petals or candles and then jazz up the outside with even more florals and greenery. We love how this look is both rustically-inspired but also one for the storybooks as well.